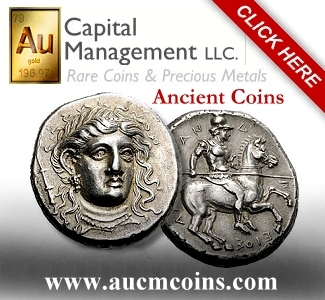 CoinWeek Ancient Coin Series By Mike Markowitz…. In 2007, Canada captured a world record by producing five examples of a 100 kilogram gold piece (220.5 pounds, or a bit over 3215 troy ounces). 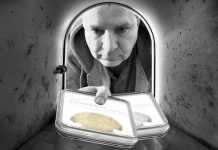 It was 53 centimeters in diameter (21 inches) and three centimeters thick, denominated at one million Canadian dollars. Without electric furnaces or hydraulic presses, ancient mint masters could not duplicate this feat, but they still managed to produce some enormous coins. 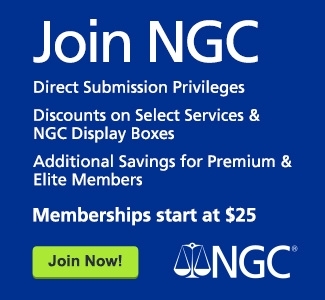 Because they could. Our earliest numismatic monsters come from Paeonia (now the Former Yugoslav Republic of Macedonia), issued about 480-465 BCE by a Thracian tribe called the Derrones. They mined silver and formed it into lumpy 30-40 gram coins, which they traded with the Greeks, their civilized southern neighbors. 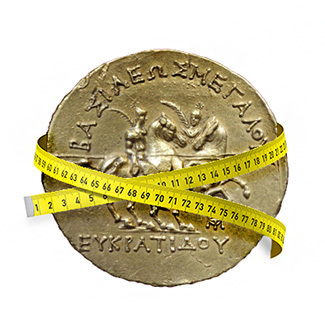 Despite their irregular weight, these rare coins are considered 12-drachma pieces or dodekadrachms. On the obverse, a man drives an ox-cart on a field decorated with a Corinthian-style helmet. The reverse bears a triskeles – three running legs arranged in a pinwheel pattern. This rare type has sold in recent auctions for prices ranging from about US$5000 to over $30,000 for the coin illustrated here. Egypt was rich and the Ptolemies liked to flaunt it. The Macedonian Ptolemies, who ruled Egypt from 323 to 30 BCE, loved grand gestures and spectacular flourishes, even on their coinage. In most of the Greek world, standard gold coins were staters of about 8.5 grams, roughly a month’s salary for a mercenary foot soldier. 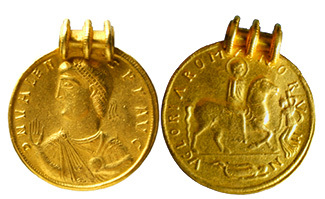 For several generations, Ptolemies issued massive gold oktadrachms of about 28 grams. 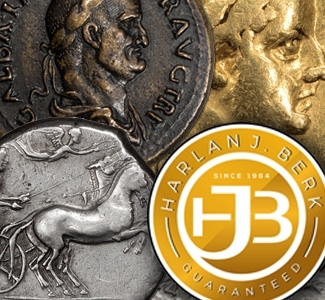 Recently, hoards of these beautiful coins have appeared on the market at prices ranging from about US$7000 to upwards of $50,000 for exceptional specimens. 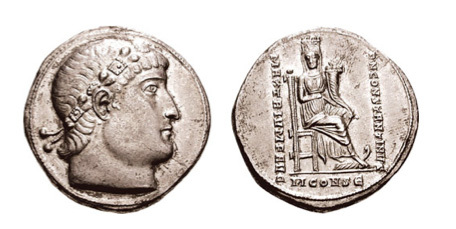 Although Egypt had no silver mines, Ptolemy II (ruled 285-246 BCE) and Ptolemy III (ruled 246-221) also issued impressive silver dekadrachms (about 35 grams) and even a pentakaidekadrachm or 15-drachma piece of over 52 grams. These bore the images of queens Arsinoe II and Berenike II, respectively. [there’s no pic of the decadrachm. I’m assuming Arsinoe II is on it?] In recent auctions, these rarities have sold for prices ranging from US$14,000 to over $50,000. Because the early Ptolemies controlled the richest copper source in the ancient world on the island of Cyprus, they also issued huge copper coins, probably denominated as one-drachma pieces. The weight and diameter of these thick pieces varied, but the biggest measured about 47 mm in diameter and the heaviest reach about 97 grams. 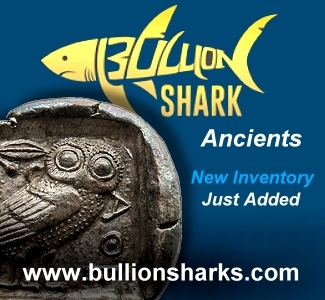 Worn specimens are some of the most affordable ancient monsters, going for under $US300 in recent sales. Olbia was a Greek colony on the northern coast of the Black Sea (now part of Ukraine). Lacking silver, the Olbians–beginning about 450 BCE–issued large cast bronze coins nearly 70 mm in diameter and weighing up to 140 grams. On the obverse, a gorgoneion defiantly sticks out her tongue. To us this image is amusing, but to ancient Greeks it was a protective amulet that repelled evil spirits. On the reverse, an enormous soaring sea eagle clutches a dolphin in its talons. The early Roman Republic also lacked silver, and during the third century BCE various cities cast crude bronze coins called aes grave (“heavy bronze”). The largest pieces weighed a full Roman pound (about 325 grams), and there were a range of fractions down to a half-ounce. Romans were accustomed to using bronze ingots as money, so the inconvenience of these clumsy monsters was relative. Each denomination had a characteristic symbol and mark of value. The obverse of the one-pound “as” bore the double-faced head of Janus, god of doorways. The reverse showed the prow of a warship, with its heavy bronze ram. Many of these pieces originate from a large 19th century Italian hoard. New finds are uncommon, and a controversial agreement with Italy restricts their importation into the US. Prices range from US $3500 to over $7500 for exceptional specimens. Baktria, in northern Afghanistan and Tajikstan, was a prosperous Greek kingdom established by successors of Alexander the Great beginning about 250 BCE. Little is known about King Eucratides, who ruled Baktria c. 171-145 BCE. He fought the Parthians and conquered parts of northern India. He commissioned the largest surviving gold coin struck in antiquity: a 20-stater piece, 58 mm in diameter, weighing 169.2 grams. That’s nearly five and a half ounces. The unique example was found in 1867 in Bukhara (Uzbekistan), nearly 300 miles northwest of the Baktrian heartland. Eventually acquired by Napoleon III, it resides today in the Bibliothéque nationale in Paris. On the obverse we see the king in profile, wearing a plumed cavalry helmet. On the reverse, the twin heroes Castor and Pollux carry long lances and palm branches and ride prancing horses surrounded by a carelessly lettered inscription: “Great King Eucratides.” The Smithsonian in Washington has a similar 15-stater gold piece of Eucratides that most experts regard as a 19th century fantasy. A century after Eucratides was murdered by his own son, another Baktrian king, Amyntas, came to power. Almost nothing is known about him, either; one source estimates his reign as c. 95–90 BCE, another as c. 85-60 BCE. 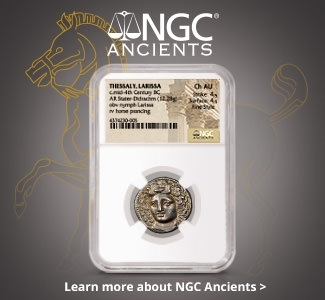 But he issued some of the largest silver coins struck in antiquity: double-dekadrachms 60 mm in diameter, weighing 85 grams. The six known examples come from one hoard found in 1946 in Kunduz and they miraculously survived the Taliban years in the vault of the Afghan National Museum. On the obverse we see Amyntas with same type of helmet worn by Eucratides. The reverse shows either an enthroned figure of Zeus or Tyche, goddess of fortune. The inscription proclaims “Victorious King Amyntas” but we can only guess at what victory these extraordinary coins commemorate. We don’t know what they were called back then, but numismatists call them “five siliqua medallions.” A siliqua was based on the weight of a carob seed, only 0.2 grams (today we call it a “carat”). The coin contained 17.5 grams of silver, which equaled one gram (five siliquae) of gold in value. 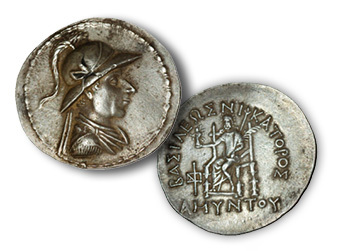 The regular imperial silver coin of that era, the argenteus, weighed only about 3.5 grams. Constantine’s medallions are exactly the weight and size of ancient Greek silver tetradrachms – coins that had not been issued for centuries but were still remembered with pride by the Greek-speaking inhabitants of the Empire. This may have been a deliberate choice (Ramskold). 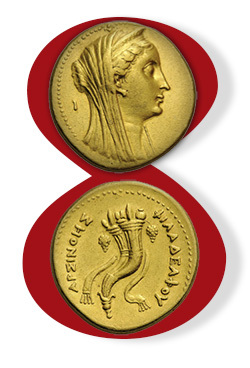 About 18 examples of this medallion are known – 15 with the Constantinopolis reverse, three with Roma. The finest pair reportedly sold for US$125,000 each. Lesser specimens in recent auctions have gone for prices ranging from $7000 to $35,000. Born in 321 CE, Valentinian became emperor on 26 February 364 following the accidental (or deliberate?) death of Emperor Jovian. He took control of the west, appointing his brother Valens as co-emperor in the east. In 2009, a huge medallion of Valentinian appeared on the market. It sold at auction for $300,000. Weighing 104.3 grams and measuring 66 mm in diameter, it would have been denominated as a 48-siliqua piece–by far the largest surviving Roman silver coin. Although struck from dies at the Antioch mint, this was clearly an imperial presentation piece; a prestigious gift to a high official. That’s the face we see on this medallion. The Kunsthistorisches Museum in Vienna has an even more spectacular unique gold piece in the name of Valentinian’s brother Valens, who fell in battle against the Goths at Adrianople in 378. With a heavy loop soldered to the rim, the piece was clearly intended for wear as an ornament. Although the style is “barbaric”, the inscriptions are perfect, suggesting that the goldsmith who crafted it was literate. It was found in a hoard of fourth century medallions in 1797 near the village of Szilágysomlyó (now in Romania). But this is, well… not exactly a coin. It appears to be a barbaric cast imitation of a lost original, which must have been a struck medallion of 36 solidi (half a Roman pound or about 163 grams). If that original ever turns up, it would surely be worth several million US dollars.